Much to the surprise of exactly no one, the youthful Nintendo Switch is already gearing up to be the home for first-party platformers. Nintendo's brief presentation showed us more of the wildly creative Super Mario Odyssey and introduced a colourful Kirby game that is sure to go over with fans. A third game, though, stars the cuddliest green mascot around: Yoshi. 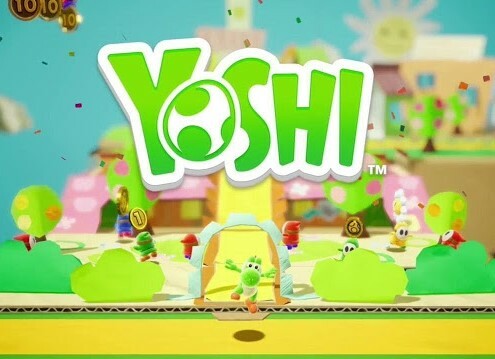 Simply titled "Yoshi" (although subject to change, what with there already being a puzzle game under than moniker), this new game promises to mix things up for the series. Trading in the wool of yesteryear, Yoshi's world is now teeming with cardboard and papercraft environments that form everything from trees to houses. Despite paper's characteristic flatness, the gameplay opens up access to the third dimension about as much as you can without actually abandoning the 2.5D platformer aesthetic. There's a mechanic that allows you to view the environment from an alternate angle, changing the scenery and revealing secrets in the process. You can even interact with enemies and objects in the foreground or background using eggs. Given that Yoshi's Woolly World featured a delightful amount of collectibles that were cleverly concealed by environments, this mechanic feels like a natural progression. At the same time, the game is still repping the mechanics from as far back as Yoshi's Island on the Super Nintendo. You've got the requisite egg system that allows Yoshi to convert enemies into yolk-free ammunition to be tossed at other foes and obstacles. This is very much the endearing romp you'd anticipate, only somehow more potent. You can grab Yoshi on Switch sometime in 2018. The mystery is whether it'll still be called that by then.